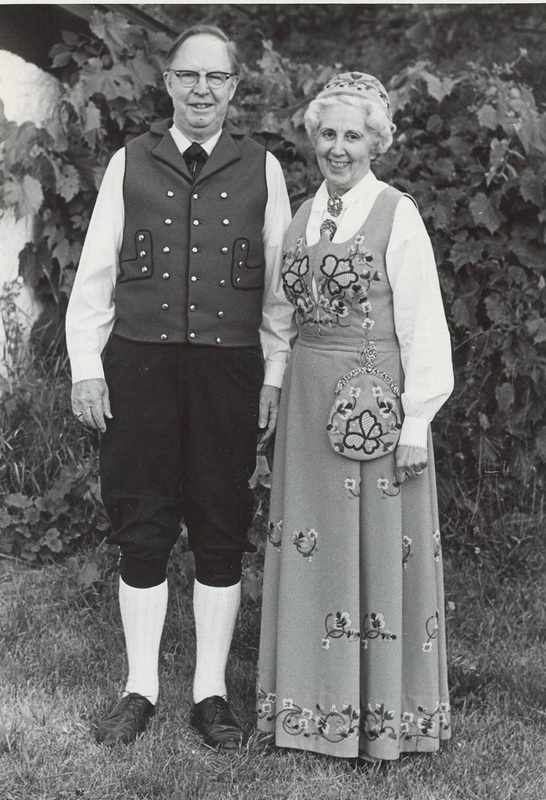 Irene Gilbertson poses in her bunad with husband Otto, 1969. MHAHS 5×7.01294. This decorated dress is a costume known as a bunad, a Norwegian rural folk garment. Irene Gilbertson created this particular outfit to wear when she took tickets and was a host at Mount Horeb’s annual performance of The Song of Norway, a play based on the life of Edvard Grieg. Begun in 1969, the popular production became an outlet for local talent and a way for the community to attract visitors to the area. Irene Gilbertson’s paternal grandparents emigrated from Norway. She was a pillar of the community and involved in many different groups, including being a long-time participant of The Song of Norway. This beautifully decorated dress is a costume called a Bunad. This particular bunad—Norwegian rural folk garment—is decorated in the Gudbrandsdahlen style. It was handcrafted and sewn by Irene Gilbertson and consists of seven pieces. This particular outfit includes: a bodice, a blouse, a small hat, a purse, 2 pins of silver metal filigree (necklaces), and cufflinks. The dress, purse, and hat are blue with intricately ornate multi-color flowers. Bunad’s are a specific movement of style of dress in Norwegian communities. They come in many forms as they are related to their specific regions. This particular garment is styled in the Gudbrandsahlen style (Gudbrandalsbunad) that originates from the Lillehammer region. This specific style could mean that it is double woven, which is usually the easiest way to distinguish it from other bunad styles. These costumes hold rich traditions within Norwegian communities, both literally and metaphorically. They were sometimes used to display wealth as they could be richly decorated with gold and silvers, but are now more commonly used as religious confirmation presents or as costumes in performances. Irene Gilbertson, and the memory of all her accomplishments, remains a prominent member of Mt. Horeb, Wisconsin. She was born and raised in Madison where she met her husband Otto. They then owned and operated Gilbertson Hardware in Mt. Horeb for 43 years. She was a pillar of the community and was heavily involved in many different groups. Her impressive resume includes: long-term membership with the Evangelical Lutheran Church, Matron of the Mt. Horeb Eastern Star, organized the Rainbow for Girls, a charter member for Mound View Garden Club, but most importantly she was a charter member and curator for Mt. Horeb’s Historical Society and participated in the Song of Norway for 14 years. She clearly loved being active and engaging with her community, and participated and created groups that continue to last in Mt. Horeb today. In 1969 Irene Gilbertson began her participation in the Song of Norway, a small stage production. This play was originated in 1944 as an operetta on Broadway and portrays the life of Edvard Grieg—a composer who struggled to create an authentic Norwegian national music. The play was popular among these Norwegian communities and was performed throughout the state. It was often used in festivities and celebrations that focused on the towns’ Norwegian heritage. The play was so popular that Hollywood attempted to ‘perfect it’ in a film adaptation, that ultimately flopped. This bunad is what Irene Gilbertson created and wore for Song of Norway, and follows the Gudbrandsahled style—however, this dress was typically black, but Irene Gilbertson preferred blue. It is through the generous donation of her family that Irene Gilbertson’s bunad has a home at the Mt. Horeb Historical Society.